He’s the psycho who rules by fear, manipulating people into thinking they need him for protection. He’s the guy with the super-huge ego who spouts cheesy nursery-rhyme jokes, along with plenty of R-rated crap that will surely be censored for television. He’s the guy who substitutes f-bombs for every single word in the English language, often dropping multiples within the same sentence. He’s also the first person to render Rick helpless, putting him in his place, upon his dramatic entrance. He’s definitely not someone to underestimate. This is a homicidal maniac who lives within a mill surrounded by a killing field that uses the undead to protect it (much like what was copied by Fear the Walking Dead). He has multiple wives and acts like he’s a god. He expects respect, but gives none in return. He sets stringent rules for his people (The Saviors) and dishes out cruel punishment when they cross him. That punishment often comes from Lucille or The Iron. Lucille is his beloved baseball bat that is wrapped with barbed wire that he loves more than anything (or anyone) else. Apparently, Lucille likes two things: being sung to and bashing in people’s brains. He’s crude, he’s rude, he tells bad jokes, he says exactly what’s on his mind (which is always ridiculous) and unlike The Governor, he hates sexual violence, finding it “unseemly.” His unpredictability could be a great thing for the TV show. Most likely, it will take the character into new directions not found in the graphic novel. As Season 7 of The Walking Dead returns tonight on AMC, Rick’s Gang is in a precarious position. For the last year, the network has been teasing fans about who will die at the hands of Negan in the season premiere. Recently, the showrunner has revealed there will be multiple deaths taking place from this pivotal episode. So, what will happen? According to canon, it’s time to let the mourning begin for some main characters. The fates of Abraham, Glenn, Spencer, Eric, Heath and Denise are all tied to Negan. The future looks bleak for each one, but that could change, since not all of those characters are still alive on the TV show. Negan wants to be reasonable and has set boundaries for his people. He supposedly doesn’t want to do bad things, but wants them to know the consequences of their actions. He doesn’t want to kill Rick, yet. That would make him a martyr. He only wants to break Rick… slowly. Negan, himself, has admitted he can take a beating without being rattled. Sometimes he lets his guard down and when he does, he can pay the price for it. He is an enjoyable villain to read, to root against and somehow like at times, despite his deplorable actions. His fate is not revealed in this collection, but many casualties lie in his wake. As the death in the family is revealed in tonight’s episode, The Day Will Come When You Won’t Be, take note of any possible scenes that focus on Carl. 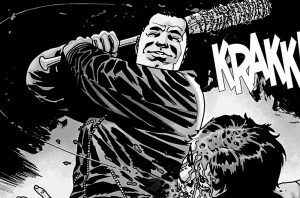 There’s a special bond that is made by Negan after the child attacks him within the graphic novel. This could be very interesting to witness on the small screen. I also can’t wait to see the introduction of King Ezekiel and his pet tiger, Shiva, of The Kingdom. Ezekiel is truly one of the best characters created by Robert Kirkman and company and hopefully, his character’s portrayal on TV will live up to his greatness in the book. I also can’t wait to see the uneasy partnership formed between Rick the Prick and Dwight. Season 7 is gonna be the best one, yet!